Friends may visit with Richard's family at the church from 9 AM until 10:45 AM. Richard volunteered and served on the board at Guiding Light for many years. 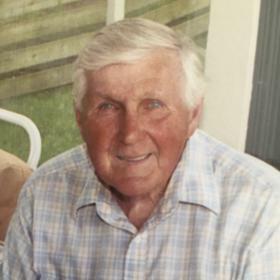 Richard W. Hoonhorst was a wonderful husband, father, grandfather, and great-grandfather. Well known as a cement contractor throughout the community he loved, Richard’s hard work provided for his family in countless ways including annual trips to Cedar Point every Fourth of July! After a long day’s work, Richard was known to come home and soak in the tub listening to country music or old hymns. Although he will be deeply missed, Richard leaves behind a wonderful collection of memories that his loved ones will cherish forever. Looking back on the 1930s, it is difficult to recall much of anything that wasn’t affected by the Great Depression. There were few jobs and a soaring unemployment rate that left countless American families without homes. Despite these tough times, Henry and Frieda (Wendel) Hoonhorst celebrated with great joy the arrival of their newborn son, Richard, on May 30, 1930, in Grand Rapids, Michigan. The oldest of eight boys followed by one baby sister, Richard's birth brought much happiness to the family home. 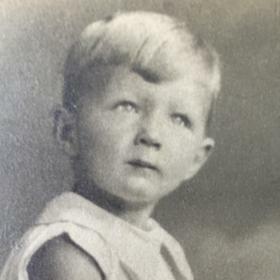 Growing up near Sherman and Eastern, Richard lived a typical childhood of the times. He learned his strong work ethic from holding a paper route from a young age. Attending several different schools through the 11th grade, he often found himself in his fair share of childhood mischief. By the time he was of age, he enlisted in the United States Air Force and served his country with the Air Police in Panama for three years. His time in the service taught him the value of a hard day’s work. A unique and touching part of his life story is his young romance with the young woman who caught his eye just before leaving for duty with the service. Lois Fryling was walking home from Kelloggsville Christian School and Richard took one look and knew that she could be the one! He gave his good buddy the job of getting her address and while he was away in the service he and Lois relied on the postal service to kindle their relationship. Although Richard was nearly five and a half years her senior, the two of them shared many commonalities and the feelings were mutual that theirs was a special love. 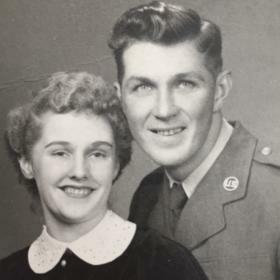 Just a few short months before Lois graduated from high school, Richard proposed and the happy couple joined in marriage on October 6, 1954, at Kelloggsville Christian Reformed Church. On a shoestring budget, they set off on a beautiful honeymoon to Niagara Falls and then made their way into upstate New York. By the closing of their trip, they were short on cash and needed to decide between sleeping in the car and eating, or staying in a hotel and not eating. They chose to fill their bellies and slept in the car! 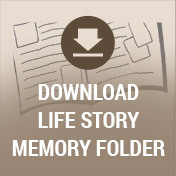 These early signs of managing whatever trials and tribulations life sent their way helped them build a lasting foundation for a marriage of more than sixty years! During these early years, Richard was working for Jack Veneklasen before venturing into his own cement contracting business. He worked mostly flat work such as sidewalks, driveways, and flooring. Their first home on Garfield was one that he built before building another one right next door! Richard was strong and had a booming voice to match his strength. The physical work took a quite a toll on him. During spring, summer, and fall the days were often long and tiresome. By winter, the business was slow enough to enjoy time for coffee with friends as well as ice fishing. After moving a few more times, he and Lois settled into their longtime home on Annie Ave NW where they raised their four wonderful children. As a father, he was the disciplinarian. Although he never used it, he was known to remove his belt to send them the message to get themselves in line! A man of great tradition, the family never missed a Memorial Day or Labor Day breakfast at Grand Haven State Park. The church was very important to him through the years. 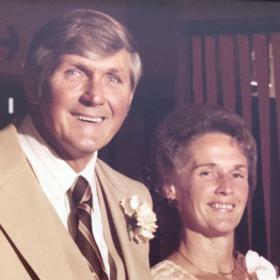 As a matter of fact, throughout their entire marriage, he and Lois were members of West Leonard Christian Reformed Church. In their earlier years of marriage, the church greatly helped him as he struggled with his addiction to alcohol, while also caring for his family during a difficult time. Over the years, he credits the church for deepening his faith as well as his acceptance of other people. 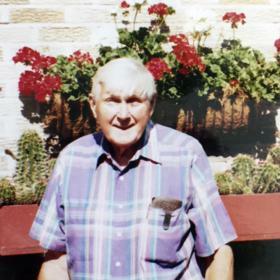 To give back, he never hesitated to serve or volunteer in any way, including serving in the role of a church Elder as well as helping with the Guiding Light Mission for many years as well. When his own children were young, he spent time during the winter volunteering with Mississippi Christian Services. Richard was never afraid to share his faith in his Lord and Savior. He never did it by preaching but rather living each and every day of his life by being honest, sincere, and loving others unconditionally. It was no surprise that family was equally important to him than his faith. Nothing brought him more joy and happiness than the times they were together. He and Lois shared in many special trips and vacations together, even one memorable trip to Alaska, however, they both looked forward to Richard’s mystery trips with the grandchildren more so than anything else! Richard loved to organize and plan these trips to be remarkably surprising never letting on to where they were headed until they reached their final destination. They both cherished these precious times getting to know each of their grandchildren as unique individuals. He found great joy in bringing the entire family together for special events and occasions over the years. These were the times, he always held special to his heart. Throughout his years, Richard enjoyed many simple pleasures in life. Richard loved flowers and always enjoyed having many flowers to adorn their home. He spent a lot of time building waterscapes including fountains that he built to go in the flower beds. He also enjoyed making rugs with a loom he had obtained over the years. Social by nature, he relished in countless morning coffee hours at Sandy’s Donuts where he was known to tell his ever-popular one-liners and special jokes that many of his friends grew to know by heart! His jovial spirit and positive outlook on life were infectious. Never one to hide his true feelings, one always knew where they stood with Richard and also knew that his door was always open and the coffee was always on! Richard wanted nothing more than the best for each and every person he met and those who were lucky enough to call him a friend, husband, father, or grandfather were the luckiest of all!